I often get asked by gardeners which plants are among my favorites. As a garden designer and lifelong plant connoisseur, that can sometimes feel like a trick question. 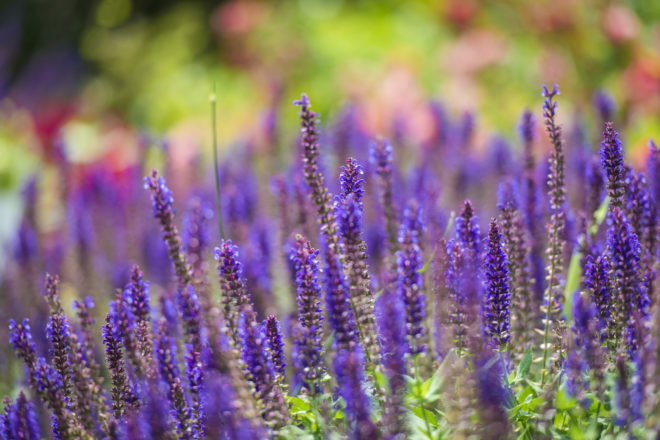 But if someone is looking for a plant that is hardy, long-blooming, and culinary to boot, then it’s tough to beat the versatile and beautiful salvia. Salvias, often referred to as “sages,” can play many roles in the garden, from floriferous annuals and showy perennials to delicious herbs. And so versatile, they often can be used interchangeably – culinary salvias are showy enough to be used in the flower garden, and perennial salvias bloom prolifically enough to be used in containers and window boxes. Almost all salvias need at least 6 hours of sunlight a day to bloom successfully and require well-drained soil. As an added bonus, bees and hummingbirds find them irresistible, but deer and rabbits find the scented foliage unpleasant, so they pass them up. Have I sold you on them yet? The following are some of my favorite salvias, along with a few ideas about how you might be able to incorporate them into your flower garden – or your next salad, chicken dish, or cocktail. Salvia splendens, often called scarlet sage, is probably the salvia that most people are familiar with. They’ve been around forever and are often available at big box stores and hardware stores in six packs. 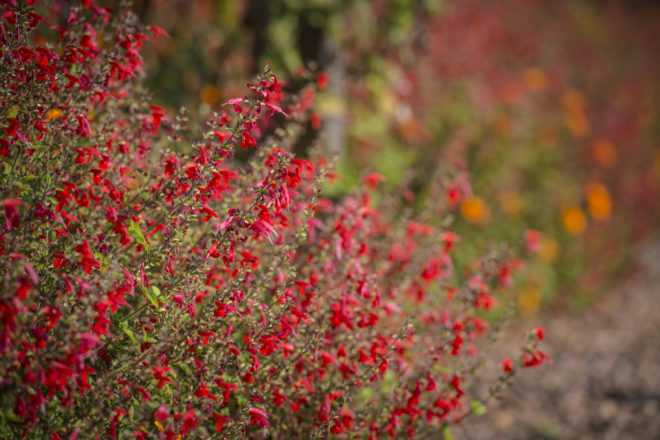 Hardy in zones 8 to 10, this annual salvia is available in a variety of colors in addition to the old standby red, such as pink, lavender, orange, and white. And like most salvias, it’s a profuse bloomer. 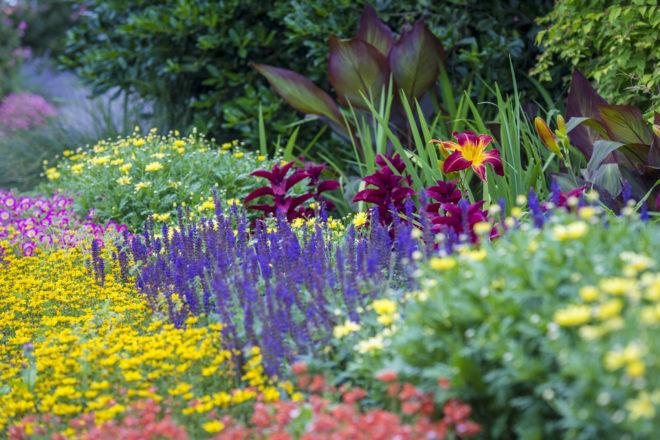 Traditionally paired with other annuals such as marigolds and zinnias, step out and combine them with grasses and daylilies. Salvia guaranitica ‘Black and Blue’ – an outstanding cobalt blue – is a stunning addition to any flower garden. It’s hardy in zones 8 to 10 and can reach anywhere from 2 to 5 feet tall, depending on the length of your growing season. Its flower spikes can be almost 12 inches long, making it easily accessible to and adored by hummingbirds. Excellent paired with reblooming daylilies, as well as fragrant oriental lilies. Salvia leucantha, or Mexican bush sage, is a late summer bloomer with velvety gray foliage and soft lavender blooms. Hardy in zones 8 to 10, it can reach 2 to 3 feet tall and take on a shrubby appearance with enough time to mature. Paired with Chinese coral cannas or ornamental grasses for a flare in the fall. Salvia microphylla ‘Hot Lips’ is a must for plant collectors or gardeners with a sense of humor. ‘Hot Lips’ claim to fame is its unusual bi-color flowers that have the appearance of a white salvia that has been kissed by someone wearing scarlet lipstick. It garners attention in the garden from bugs, hummingbirds, and humans alike. It can reach up to 3 feet tall and is hardy in zones 8 to 10. Beautiful paired with the bold blooming peony flowering daylilies. Salvia greggii ‘Wild Thing,’ or autumn sage, is a hot pink stunner that is hardy in zones 6 to 9. In addition to having a great name, ‘Wild Thing’ can reach up to 2 feet tall and has a shrubby, slightly woody appearance with blooms that delight hummingbirds. Salvia x sylvestris ‘May Night’ is an award-winning perennial hardy in zones 4 to 9, reaching about 18 inches tall. It provides a stunning blue show in spring, then will repeat flower throughout the summer with not-so-careful deadheading. Another feather in its cap is that ‘May Night’ can tolerate clay soils, a bonus in gardens like mine. Only the earliest to bloom and beautiful paired with ornamental onions (alliums) and coral colored peonies. Salvia nemerosa ‘Sensation Rose‘ creates a pink flower display with blooms reaching only 12 inches tall. 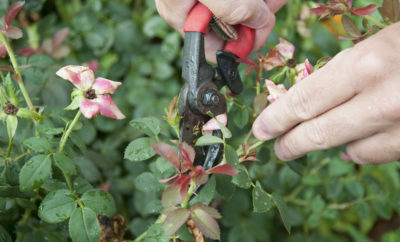 Hardy in zones 4 to 8, ‘Sensation Rose’ is another repeat-bloomer that will debut fresh flowers every several weeks. The pink flower spires make it a welcome addition to the salvia collection. Salvia nemerosa ‘Marcus’ is a desirable blue salvia because of its diminutive size at 8 to 10 inches tall. This makes it popular at the front of the flower bed where its deep violet flowers can be appreciated throughout the season. Hardy in zones 4 to 8. Salvia officinalis ‘Icterina,’ or golden leaf sage, is as beautiful as it is delicious. It grows to 1 to 2 feet tall and wide with leaves that are about 2 inches long and variegated with pale green and golden yellow. Hardy in zones 6 to 10, ‘Icterina’ is drought-tolerant once established and can be used in cooking either dried or fresh. Sage is often used in chicken and fish dishes and can be added to make a savory herbal butter. Salvia officinalis ‘Purpurascens’ is another popular culinary salvia that is also prized for its ornamental qualities. ‘Purpurascens’ foliage is a dusky purple and silvery green, as striking planted in the ground as it is in containers. Hardy in zones 6 to 9, purple sage grows 1 to 2 feet tall. 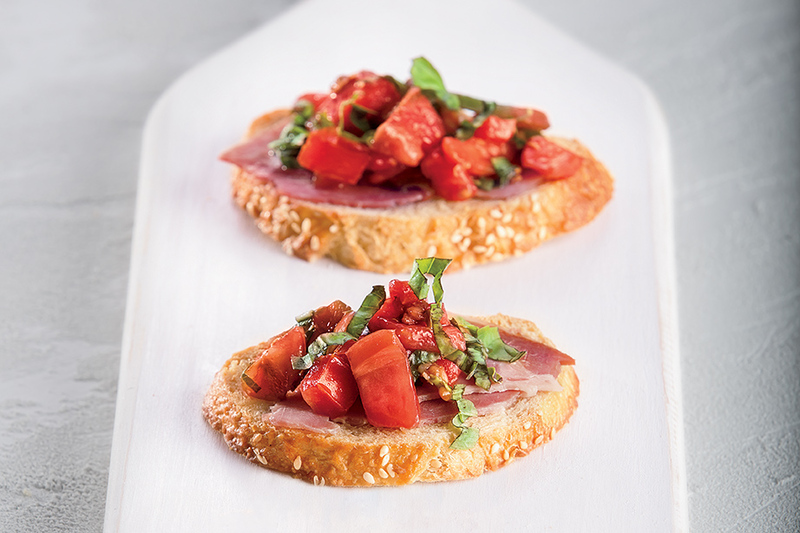 Beautiful paired with purple basil and lavender. Salvia officinalis ‘Tricolor’ outshines all the culinary sages for its showy leaves, which are purple and green outlined in a striking white margin. Hardy in zones 6 to 9, ‘Tricolor’ can reach 12 to 18 inches tall. It can be used in any dish that calls for sage flavoring. Salvia elegans pineapple sage is a summertime favorite because of its brilliant scarlet flowers and fruity, pineapple-scented leaves. It’s a late summer bloomer, but I often find it in nurseries at the beginning of summer already in flower thanks to growers’ who start it early in the greenhouse. 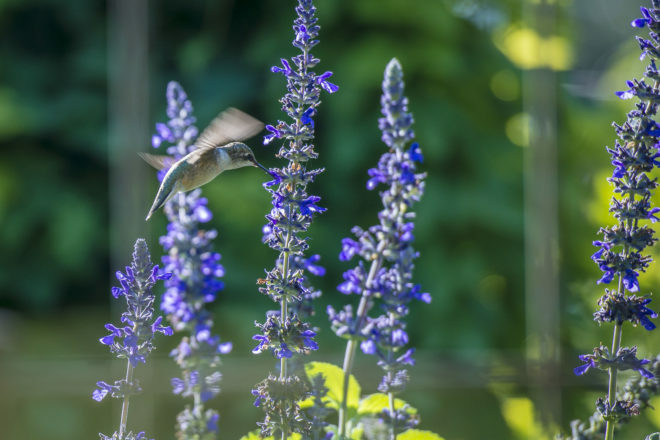 Hardy in zones 8 to 10, pineapple sage can reach up to 4 feet tall and is often blooming when hummingbirds start migrating south at the end of summer. Its culinary uses are endless – leaves and flowers can be used in salads or added to fruit cocktails. 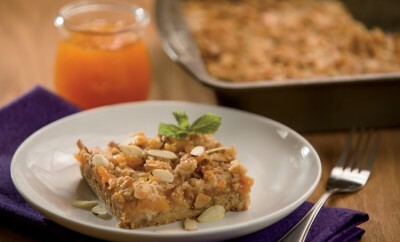 Leaves can also be used in recipes in place of mint, adding a unique twist to iced tea, cocktails, and ice cream. Or simply rub a bruised leaf around the lip of a glass of ice water for flavor. Use it with abandon. The moral of this story is that salvias are one of the garden’s most flexible, hardworking, and easy plants. Whether used as an annual or perennial in the flower garden, as an herb in the kitchen garden, or as a filler or centerpiece plant in your summer containers, salvias are worthy of a spot of honor. 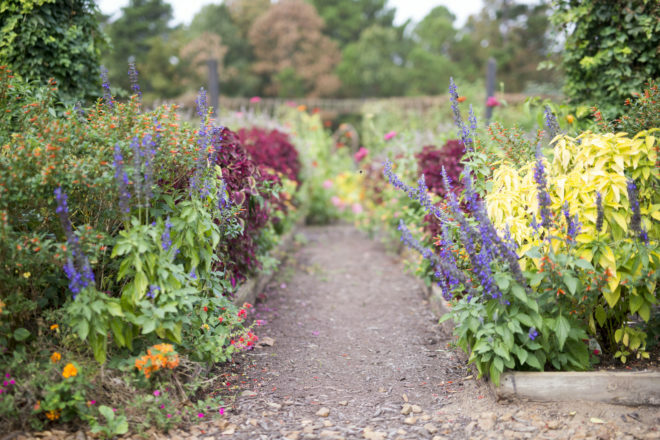 And for this plant lover, they check all the boxes – beautiful, floriferous, and in the herb garden, delicious.